The Metolius Personal Anchor System (PAS) 22 is a very convenient way for a climber to secure himself to an anchor. It’s more adjustable and easier than quickdraws or slings and stronger and safer than a daisychain. The PAS 22 can be secured to either a pair of bolts at the top of a sport climb or a multipitch anchor built with cams and a cordelette. Another feature of the PAS 22 is that it is strong enough to be used for the anchor itself though I still recommend using slings or a cordelette (but it’s nice to know that the PAS 22 could be substituted in an extreme situation). The PAS 22, also referred to as the “Ultimate Daisy” in some Metolius literature, is basically a chain made out of small slings. One end of the PAS 22 has a slightly longer, thinner loop that is connected to the climber’s harness. The other end has a loop made out of a contrasting color material so that the climber can easily find it when clipping. The Metolius PAS package showing how it is used. The PAS 22 is built with very strong 11mm (0.43″) webbing, called “Monster Webbing” by Metolius. This webbing is made out of a blend of nylon and Dyneema. This results in a personal anchor system that is rated to 22kN. For comparison, that’s just slightly less than the rating of the classic Black Diamond Positron Screwgate locking carabiner at 25kN. The unique characteristics of the PAS 22 mean that it passes the rigorous CE/UIAA Sling Standard. The PAS 22 only weighs 3.3oz (93.5 grams) and stows compactly on a harness so it won’t get in the way of the send. See the instructions below for the most efficient method for carrying this personal anchor system. The blue/yellow version is also available with a Metolius Bravo Key Lock Carabiner for just a few dollars more. 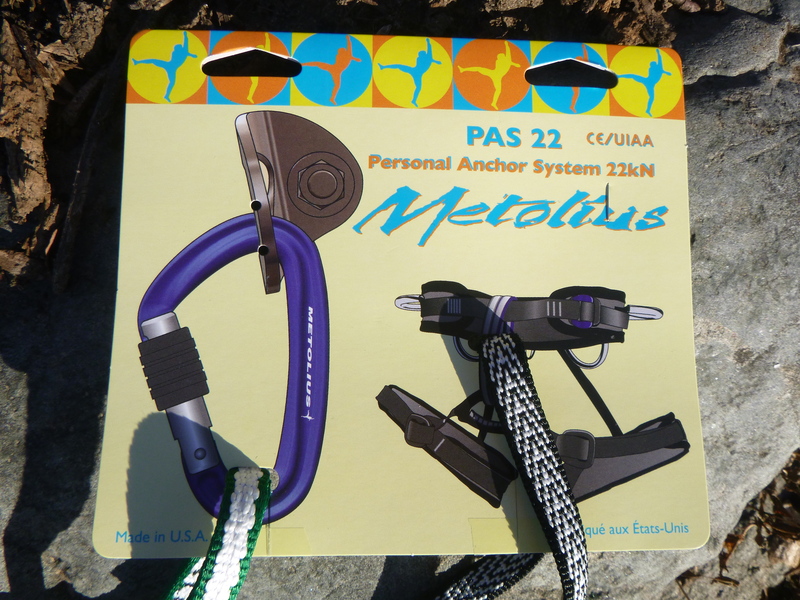 What is the Metolius PAS 22 Used For? The Metolius PAS 22 keeping a climber safe while cleaning a sport route. A personal anchor system can be used any time a climber needs to secure themselves to an anchor. One such use is in sport climbing when a climber arrives at the chains at the top of a route. If that climber is going to be the last to climb the route they now need to anchor themselves to the wall so that they can thread their rope directly through the chains so that they later can pull the rope without leaving climbing draws on the wall. This is where the Metolius personal anchor system really shines. The climber can, using two locking carabiners, clip the PAS into both chains and be completely and safely supported while working with the rope. The PAS 22 connected to the chains on a sport route. The small carabiners are nice because they fit into the links. Some larger ones won’t fit at all or will get stuck. Another similar use is in multipitch traditional climbing. The climber can secure himself to the top shelf of the anchor using a carabiner and then put his partner on belay so that the partner can begin climbing. You can use the PAS 22 in aid climbing anywhere you might use a traditional daisy chain. 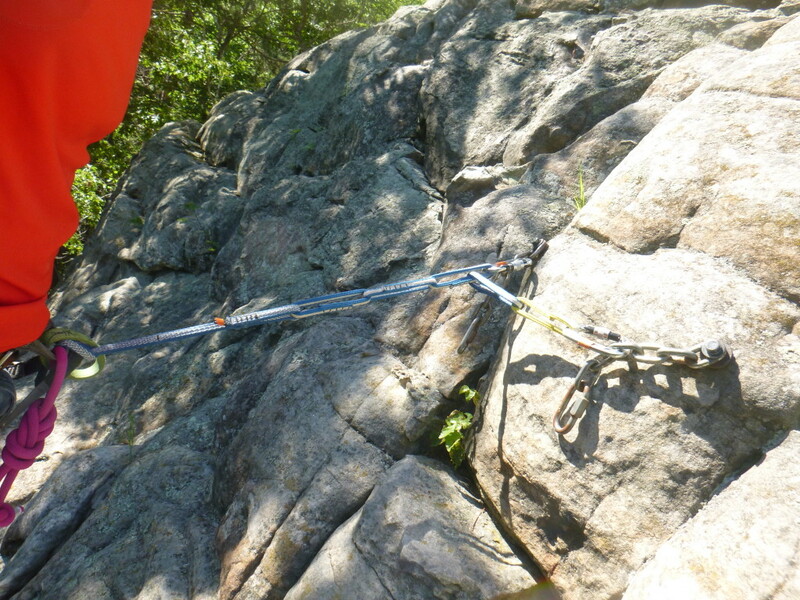 Another use of the PAS is to protect yourself while building a top rope anchor at the top of a cliff. The PAS 22 can be used to prove a secure connection to the cliff so that you are not in danger while constructing the anchor. Another use of the PAS 22 is when rappelling. There are times when you need to put some distance between the belay device and your harness and the PAS 22 can provide exactly that. If you ever need to rappel on a guided climb the guide may require such a set up. To equalize a 2-point anchor, clip one of the colored loops into each anchor point. Now pull down on the bottom loop and make sure it is equalizing both points in the intended direction of load. Shorten either or both sides of the chain to achieve the desired equalization and height. To equalize additional anchor points, simply clip a sling from the anchor point to any loop on the Anchor Chain. First, find the larger loop at one end of the PAS 22. Now thread this loop through both of the gear loops on your harness and girth hitch it in place. the other end with the contrasting colored loop should be free. Attach a carabiner to the contrasting loop. Get an experienced climber to check your work. 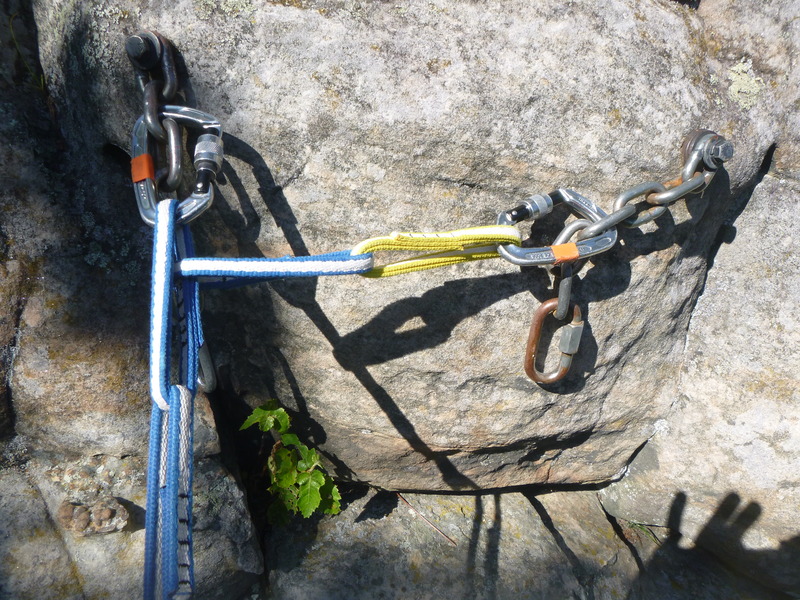 You can now secure yourself to an anchor with the carabiner when you reach the top of a route. When I use the PAS 22 on sport routes that end in two chains or hangers I like to use two carabiners, one to each of the chains or hangers, so that my life isn’t dependent on one bolt. One carabiner goes through the contrasting colored end loop and another goes through a middle loop. Be sure to set it up in a way that results in even tension on both bolts. When anchoring to a traditional anchor or when rappelling there isn’t really an equivalent to distributing your weight across two bolts. In these situations you can secure yourself with the PAS 22 and one carabiner knowing that the PAS 22 is full strength and designed for this application. Don’t take falls onto the PAS! It isn’t intended for this purpose. Here’s a helpful video from Exum Guides explaining how to use the PAS. It’s shot at Blacktail Butte with the Snake River the the Tetons in the background. I miss it! One complaint about the PAS 22 is that it may get in the way when the climber goes to the harness for a draw or piece of protection. This can be avoided by stowing the PAS 22 correctly. To do this, clip the loops together and then clip to a gear loop on your harness. This will prevent the PAS 22 from getting in your way without making it inconvenient to use. Why Not a Daisy Chain? Some people on internet forums look down on the Metolius PAS because in some circles it isn’t fashionable (especially if you stow it between your legs) or because there’s nothing it can do that can’t also be done with the rope. Both of those critiques are true but for the average climber it can make life much, much easier. Sure, the rope or draws will work as a personal anchor. But the PAS 22 is quick, easy to use, and doesn’t have any strength limitations like the daisy chain does. The Sterling Rope Chain Reactor is the main competitor for the PAS. The main differences are that the PAS is CE/UIAA certified while the Chain Reactor is not and that the PAS is a blend of nylon and Dyneema while the Chain Reactor is all nylon. I strongly recommend getting a Metolius PAS 22 if you plan to sport or trad climb. It’s a great tool to make securing yourself to the anchors simpler and easier. Be sure to pick up two small locking carabiners to use it with. I like the Mad Rock Ultra Tech for its size and price but whatever small locker you like will work . Looking for a deal? Amazon sells the PAS 22 for around $30 .